The Mahabharata is a curious mixture of history and mythology, though the former aspect is the subject of grave doubts in the minds of the professional historians. 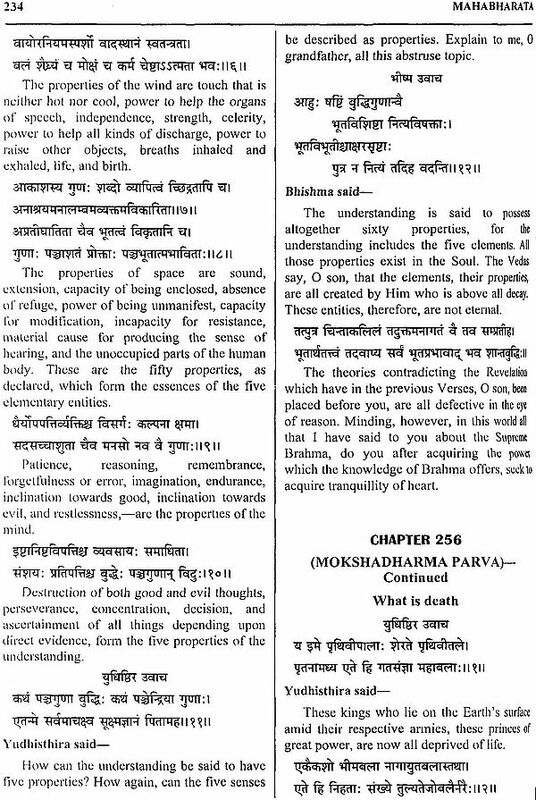 This is called the fifth Veda and it is universally acknowledged to be of pre-eminent importance. It extols its greatness itself in the following words: yad ihasti tad anyatra yan nehasti na tat kvacit (whatever is here is also elsewhere; whatever is not here is extant nowhere). 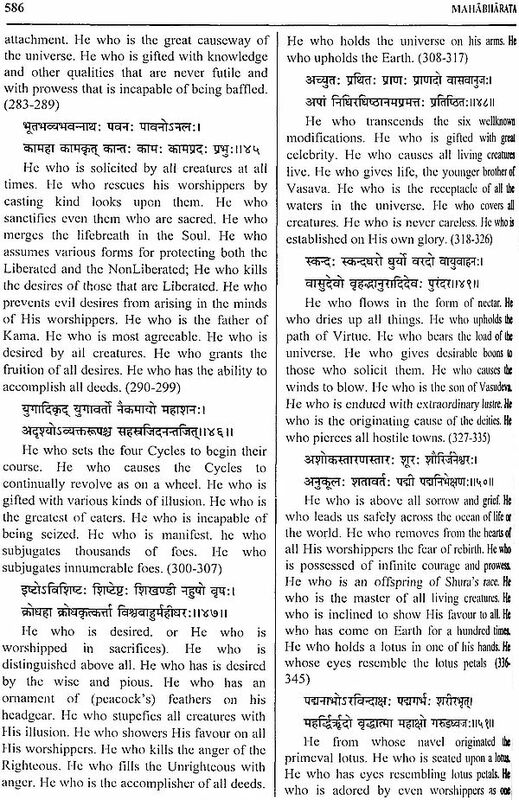 It contains not only the celebrated Gita but also a large number of other texts, which are themselves independent treatises. 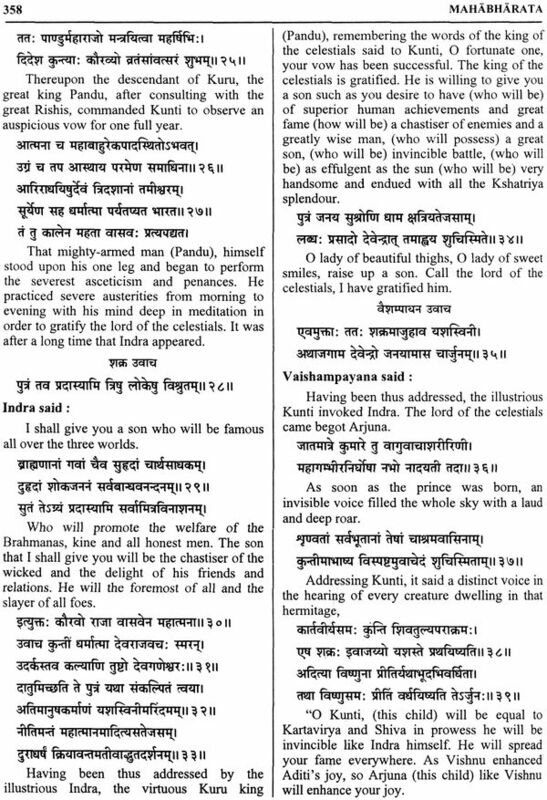 It is a valuable product of the ancient Indian literature of the post-Vedic age and seems to go back to the prehistoric stage of the human society. 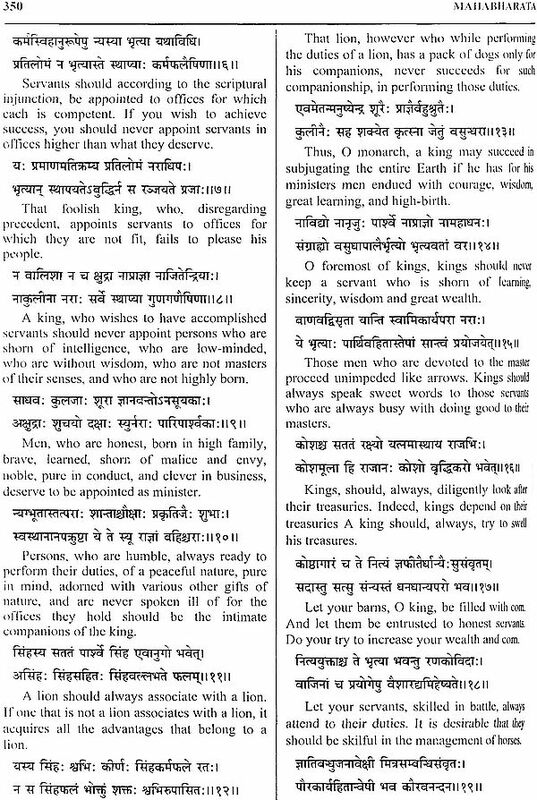 This is first time that English translation with Sanskrit text is being published. The translation is based on M.N. 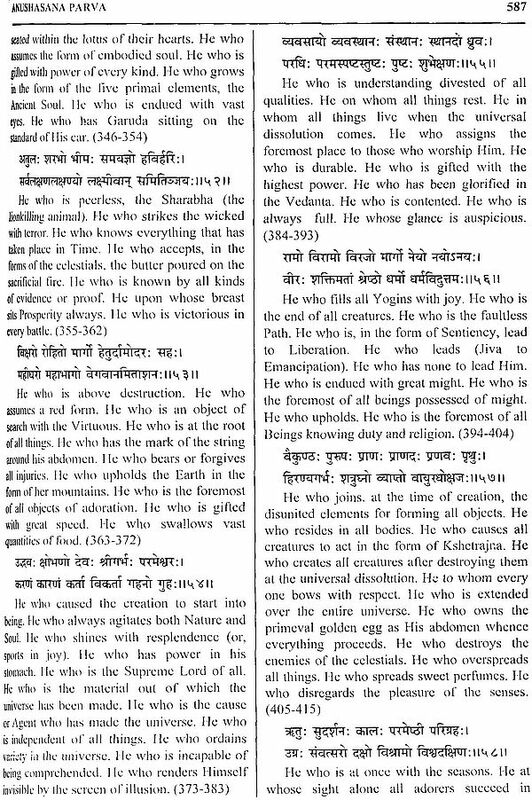 Dutta, which is very lucid and accurate according to the Sanskrit text. 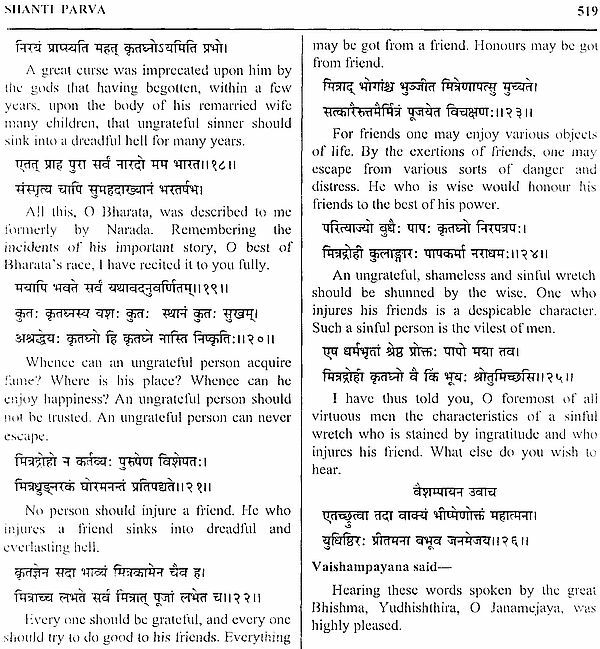 It was translated according to that time available text of Kolkata edition. 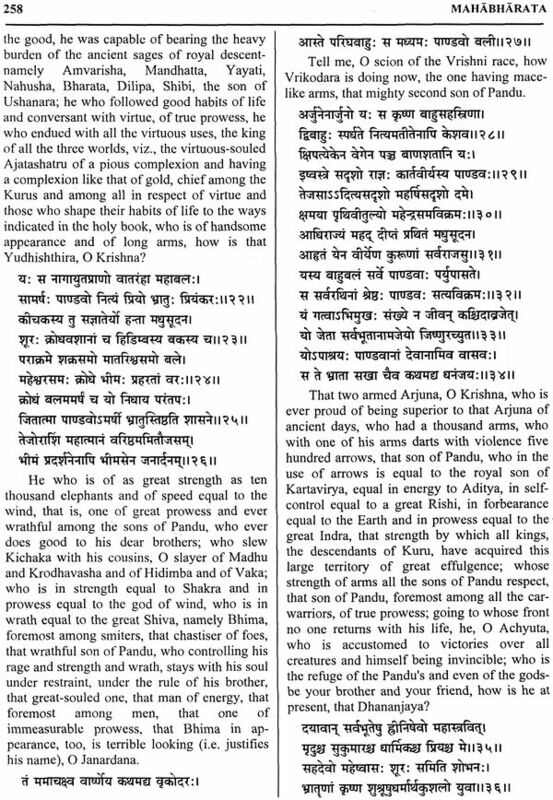 However, this text is not available now and we have arranged it through the text of Chitrashala Press, Pune, which is an authentic and complete text of the Mahabharata. 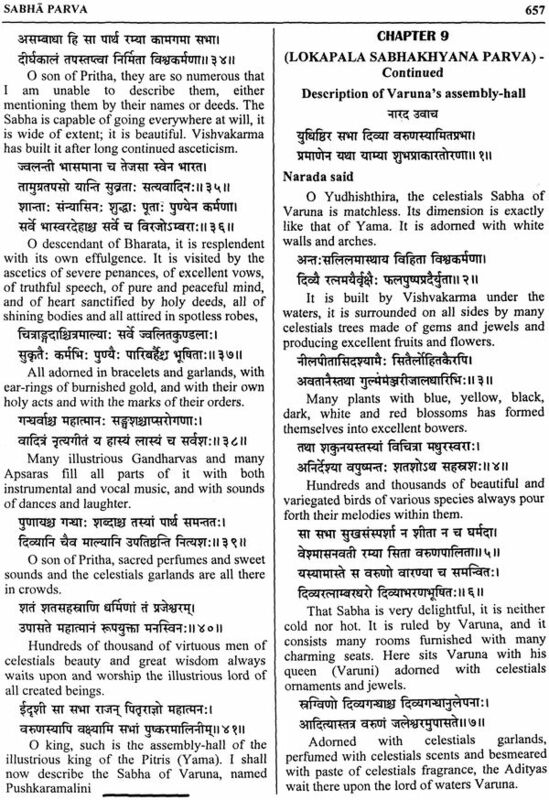 And according to this, sometimes, we do not find the translation of many slokas, that translation has been completed by the editors. 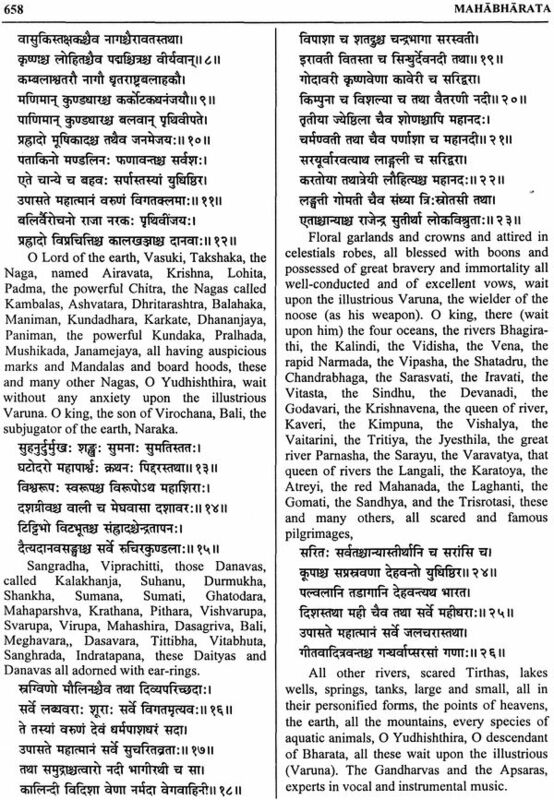 Vedic literature has been written in Vedic Sanskrit. 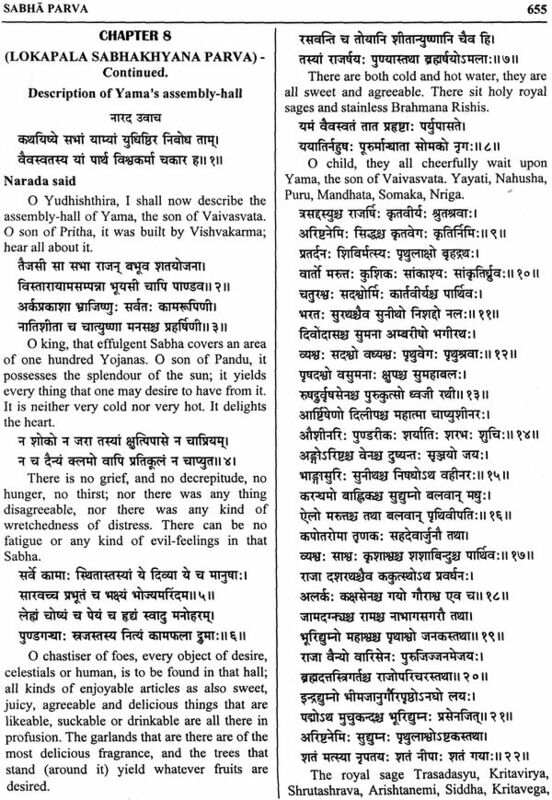 The main feature of this Sanskrit was the accent, which slowly and steadily faded out in contemporary period and completely vanished after the age of the Upanishadas. 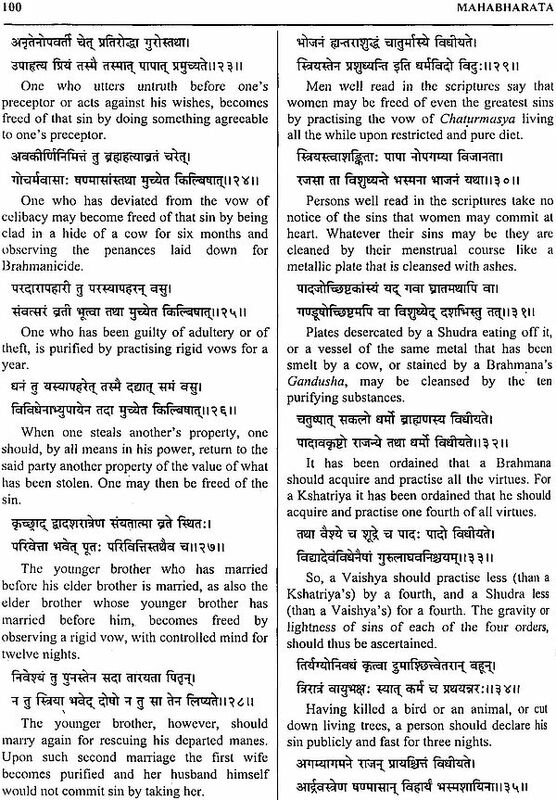 This language void of accent is known as classic Sanskrit. 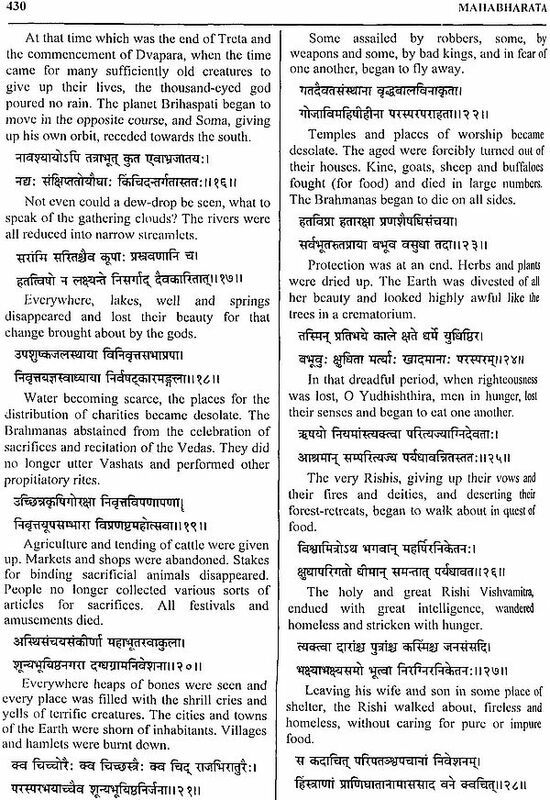 There is a lot of difference between classic and Vedic Sanskrit. 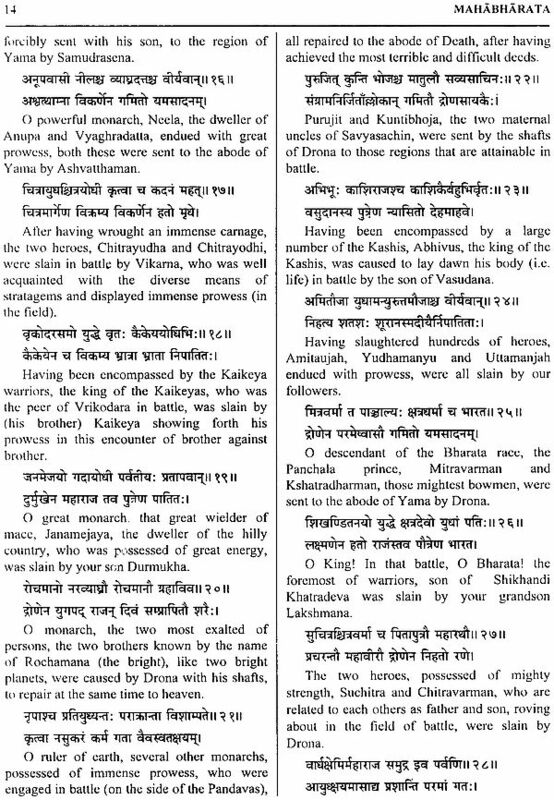 The Mahabharata has been written in classic Sanskrit. 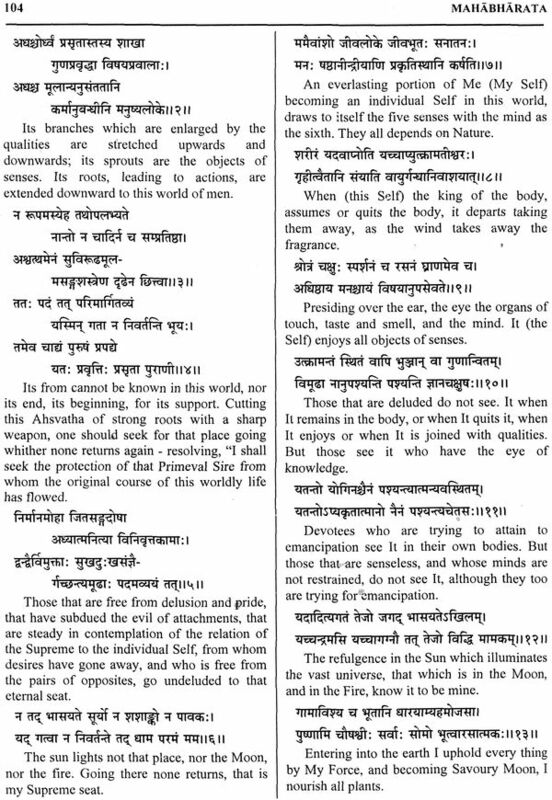 It is regarded as the store-house of political wisdom, the repository of philosophical doctrine, the container of religious dogma and, at the same time, a specimen of literary art, exercising a tremendous influence on different forms of subsequent literary compositions in Sanskrit. 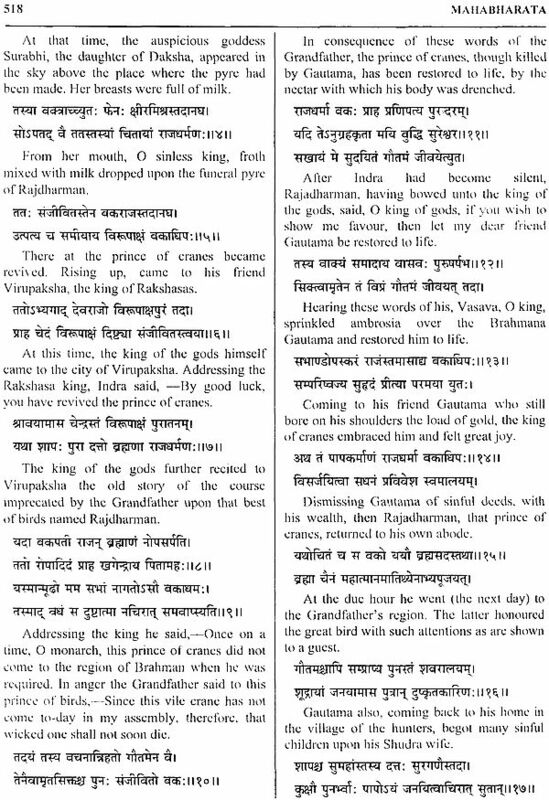 The Ramayana and the Mahabharata are two gems in Indian literature. 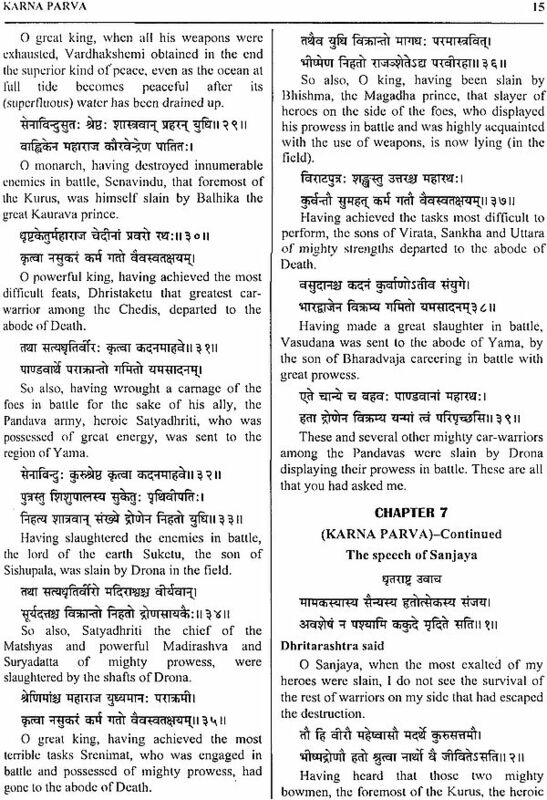 Both these epics are the basis of Indian culture and the Sumeru mountain of gold of Sanskrit literature. 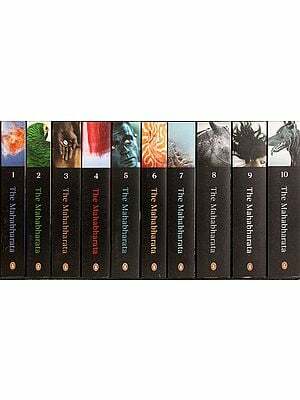 The Mahabharata holds the pride of place and it is the most popular epic after the Ramayana. The Mahabharata is known to the best history since the ancient period, as it gives a complete picture of the contemporary society, literature and culture of the India. 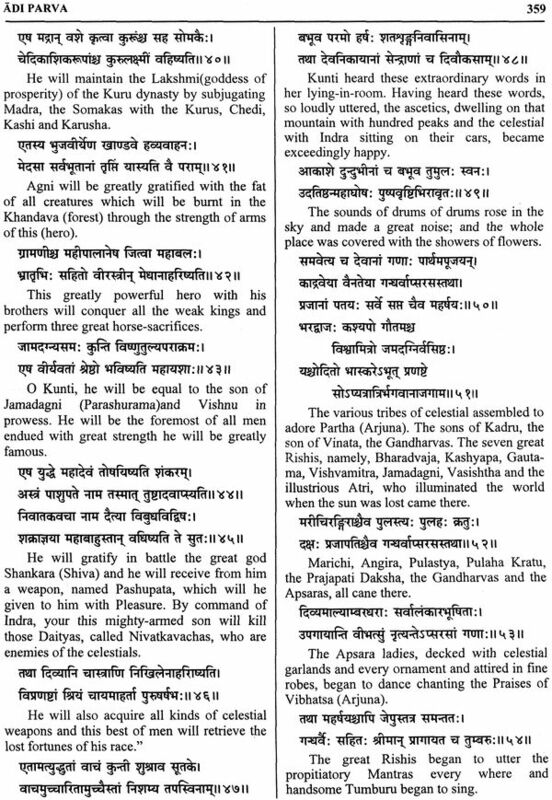 The Mahabharata contains the main history of Kauravas and Pandava and other various kings. 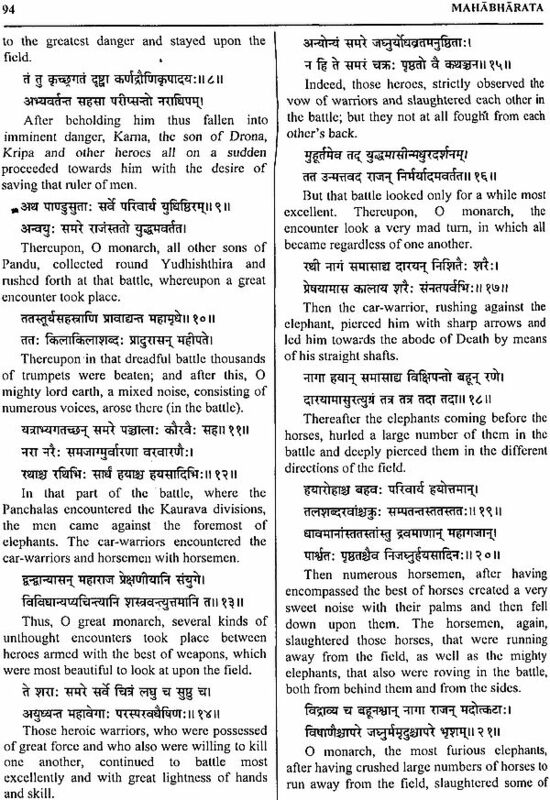 Moreover, the Mahabharata has literary importance also. It is an epic. 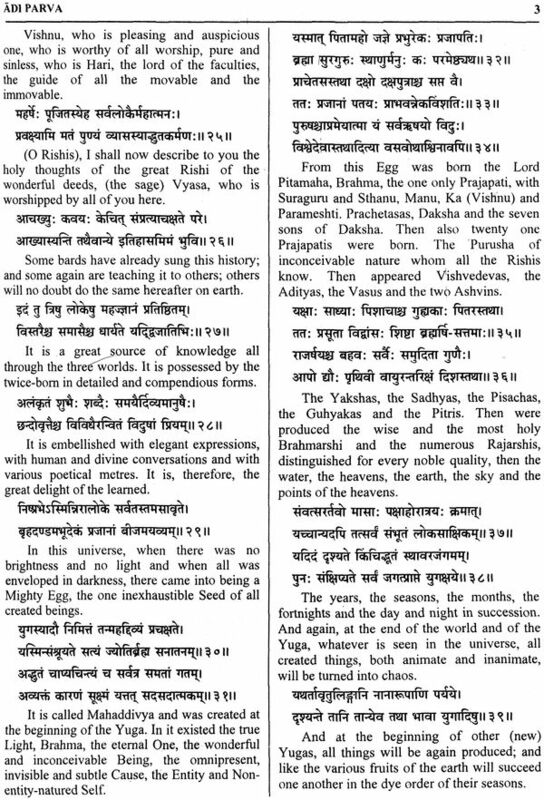 It is clearly said in the Mahabharata that this epic is like an ocean which carries out all types of compositions pertaining to all kinds of knowledge. Indeed it is a beautiful poetic work on the one hand and a code of conduct on the other. 1. 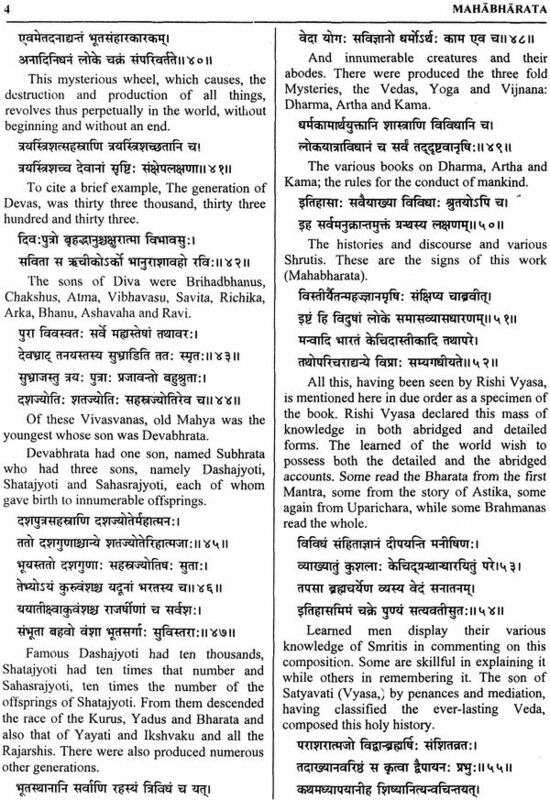 Adi Parva - The story begins with the account of the genealogy of the Bharatas. 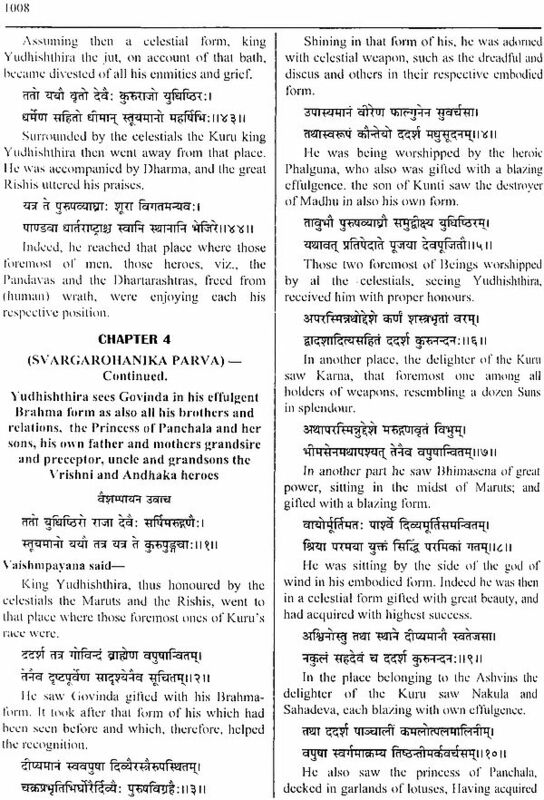 This contains the history of Chandra Vansha and elaborately describes the origin of the Pandavas and the Kauravas. 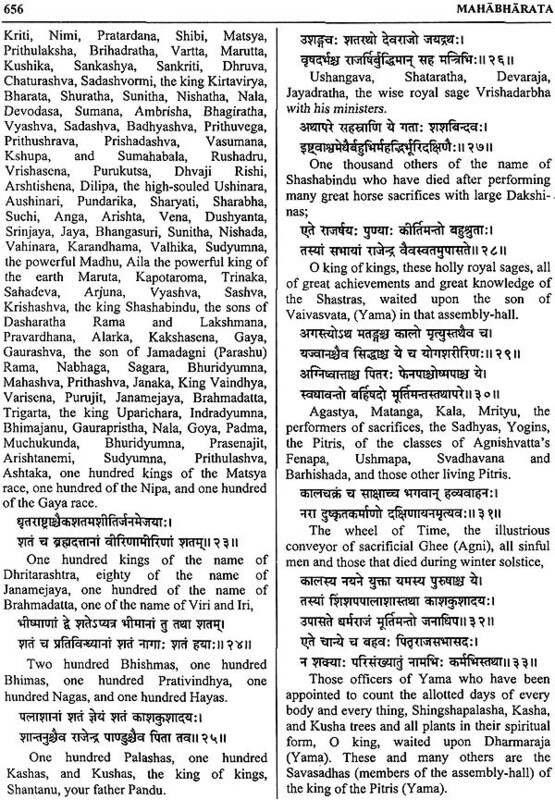 The ancestor of the royal house of Kuru is 'Shantanu' who married Ganga and their son is Bhishma. Shantanu takes as his second wife Satyavati who gives him two sons - Chitrangada and Vichitravirya. Both die without children. As a result of begetting with the help of Vyasa, the illegitimate son of Satyavati, the widows get sons - Dhritarashtra and Pandu. 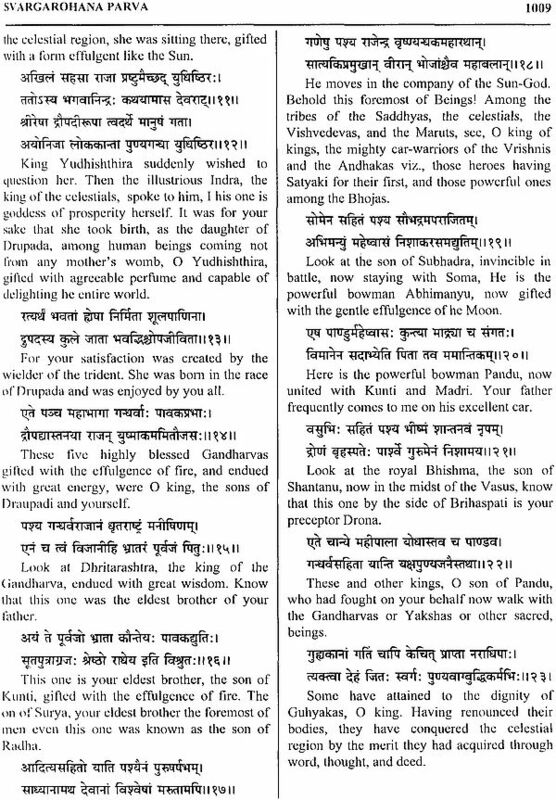 Dhritarashtra, married to Gandhari, gets one hundred sons and Pandu has two wives: Kunti who had already one son, Kama, and who gave three more sons - Yudhishthira, Bhima and Arjuna and the other wife Madri who gives birth to two sons - Nakula and Sahadeva. 2. Sabha Parva - This describes the gambling. 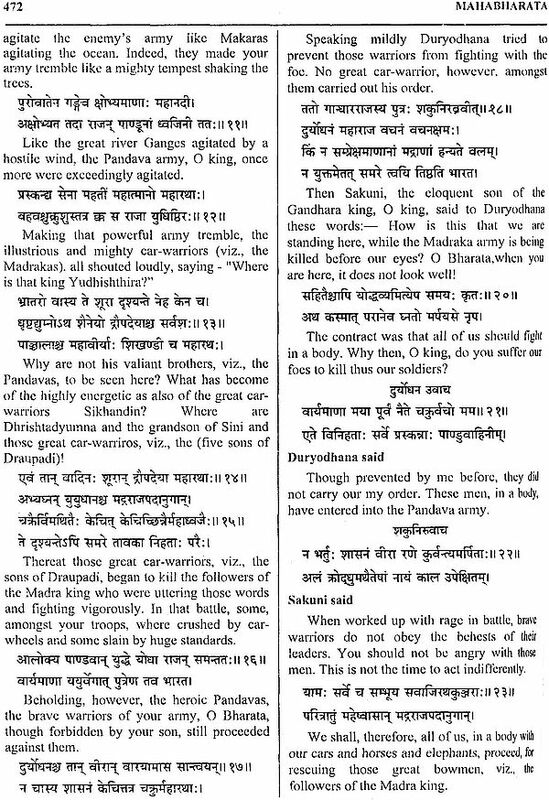 Duryodhana is full of envy and hatred. On an invitation from him, the game of gambling begins. 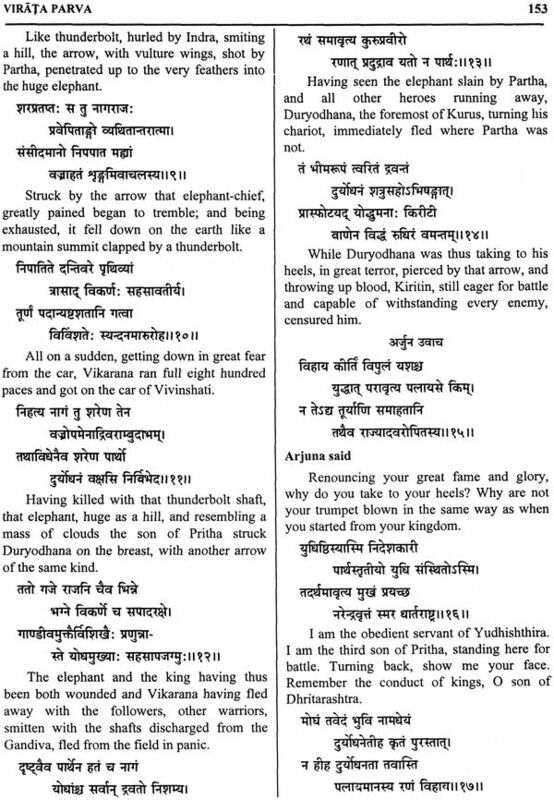 Shakuni, the expert cheat, taunts Yudhishthira who loses each and everything. At last, he stakes his wife, Draupadi who faces the coarse and brutal treatment in the presence of not only her husbands, but Bhishma also. 3. 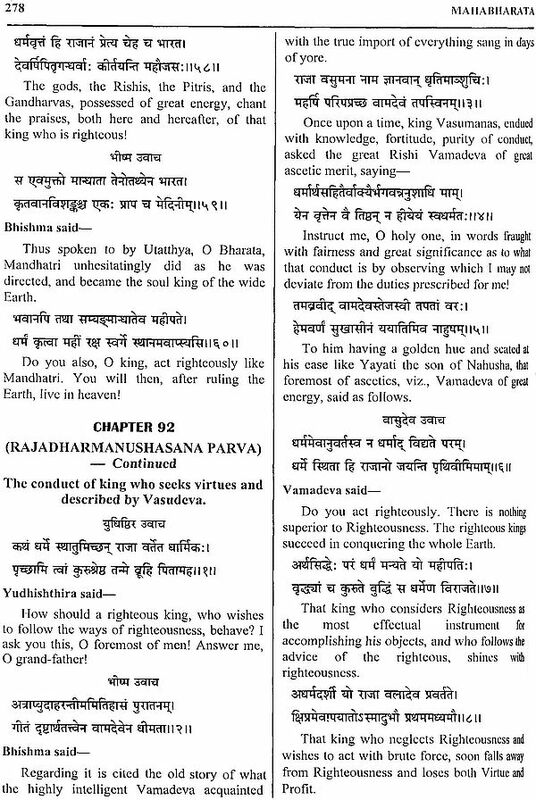 Vana Parva - This describes the exile of the Pandavas. The defeated Pandavas leave for the forest. 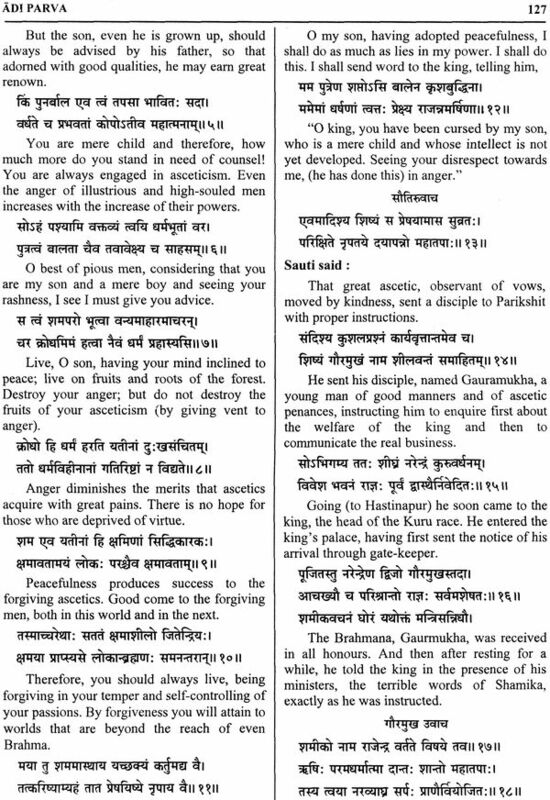 Krishna visits them and incites them to fight. Draupadi and Bhima support him. 4. 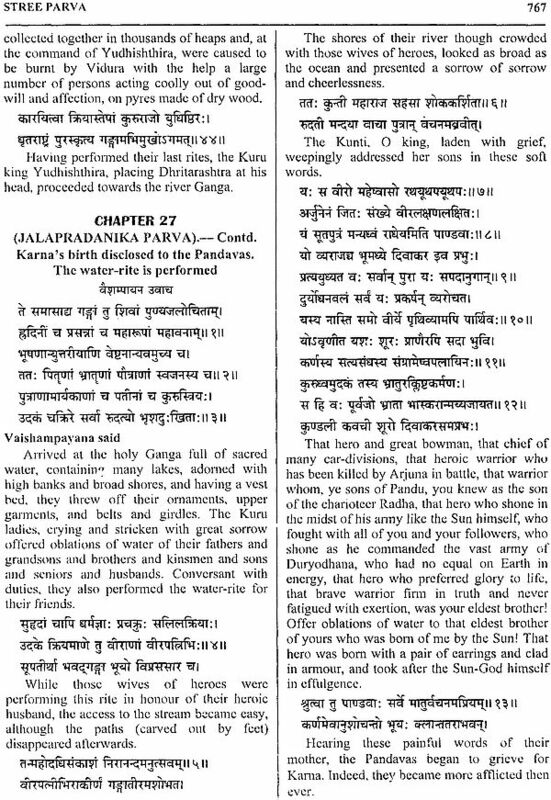 Virat Parva - This gives the description of unknown living of the Pandavas during their last year of exile. They spend this time in Virat Nagar without being recognized. When the brother-in-law of king Virat tries to molest Draupadi, Bhima kills him. At the end of thirteenth year, the Pandavas reveal their identity. 5. 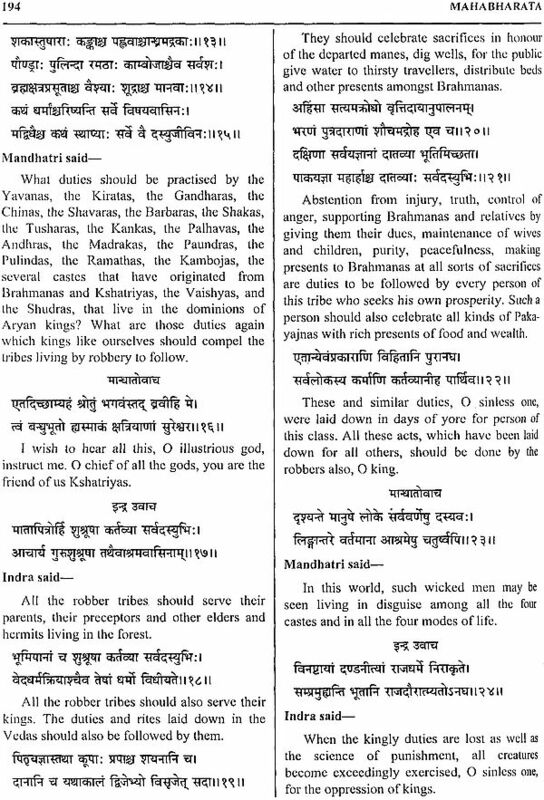 Udyoga Parva - Shri Krishna makes a serious effort for reconciliation between the Kauravas and the Pandavas. Duryodhana refuses this offer. 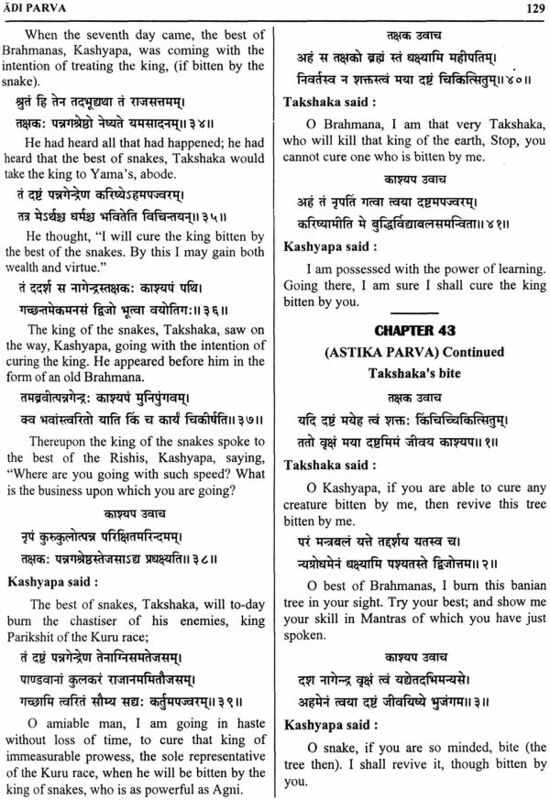 Krishna tries to persuade Kama to take the side of the Pandavas, but Kama refuses. Armies from both sides march towards Kurukshetra. 6. 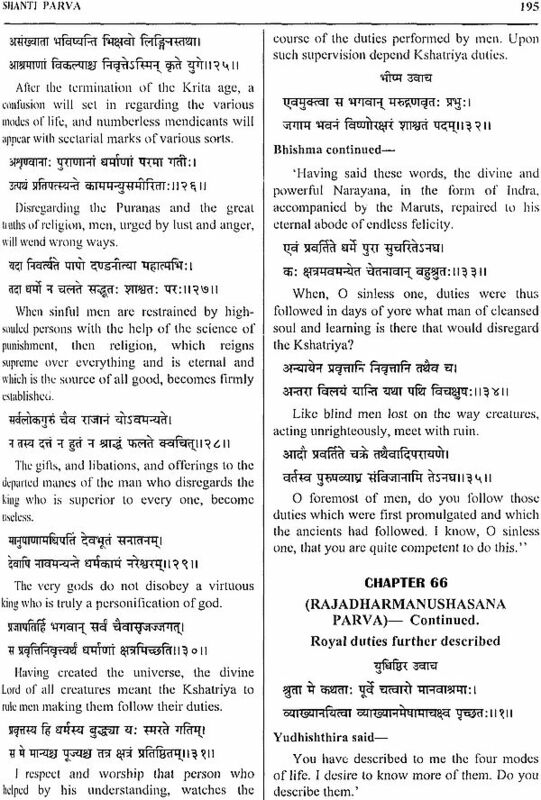 Bhishma Parva - It describes the long preparation of the war of the Mahabharata. 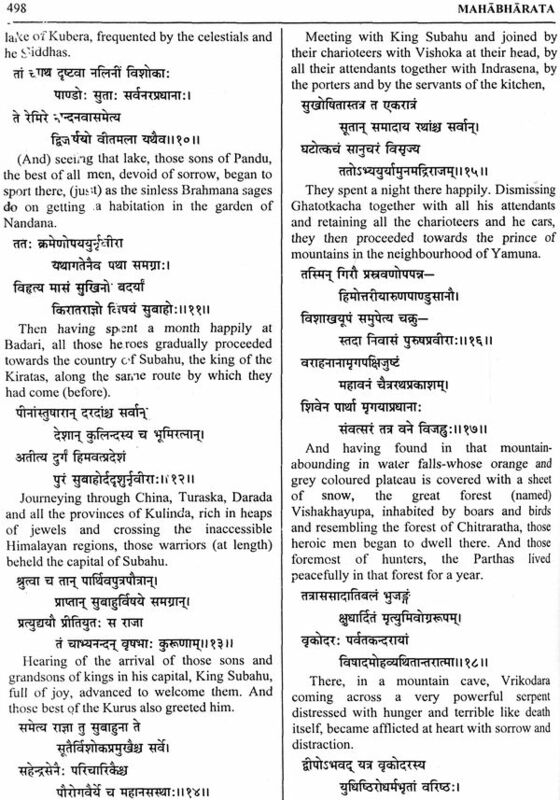 The world famous preaching of the Gita is related to this canvas. 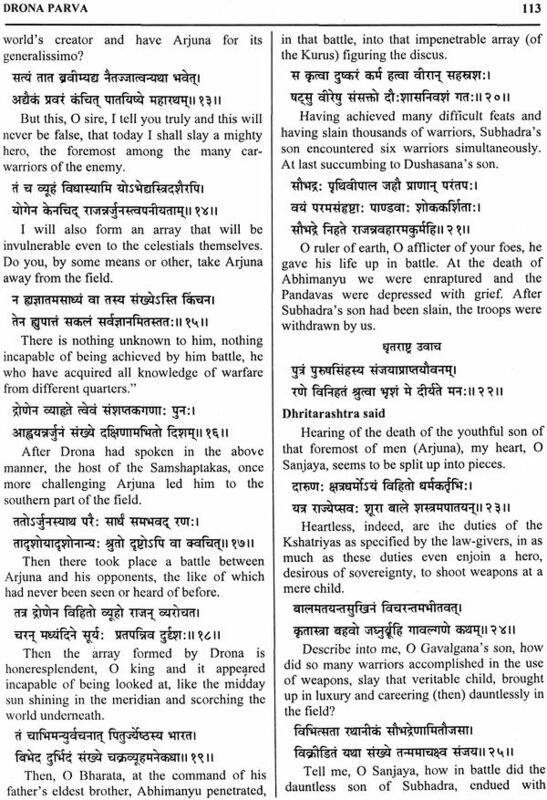 Krishna teaches Arjuna that he must not hesitate to fight, although his enemies are his own relatives. 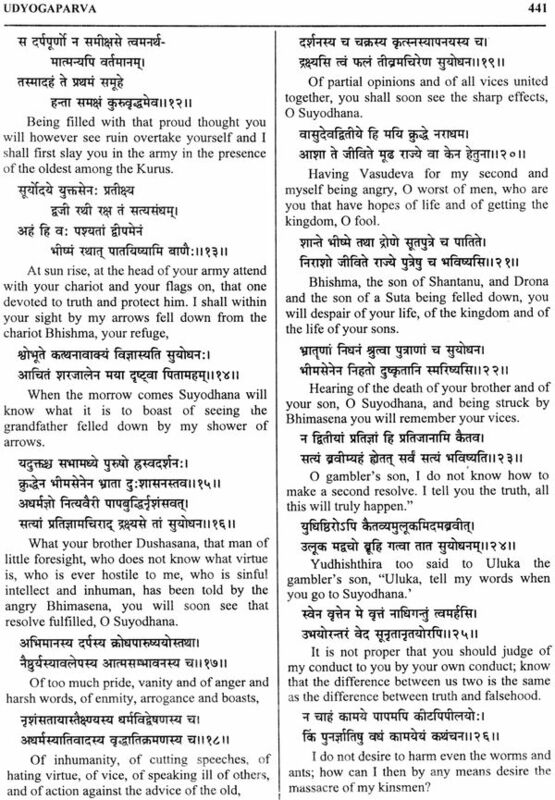 Bhishma refrains from/ fighting when face to face with by Shikhandi; Arjuna pierces Bhishma with arrows. 7. 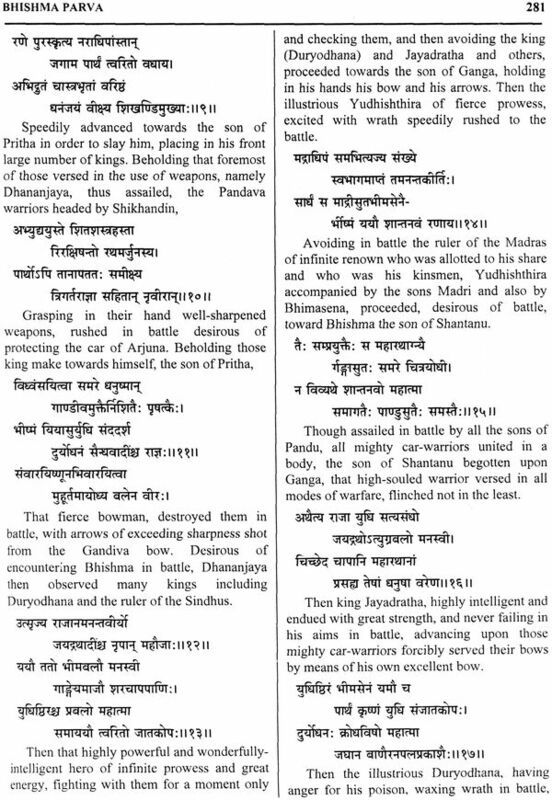 Drona Parva - It tells mainly the story of murdering Abhimanyu and Dronacharya. Here the fifteenth day of battle ends. 8. 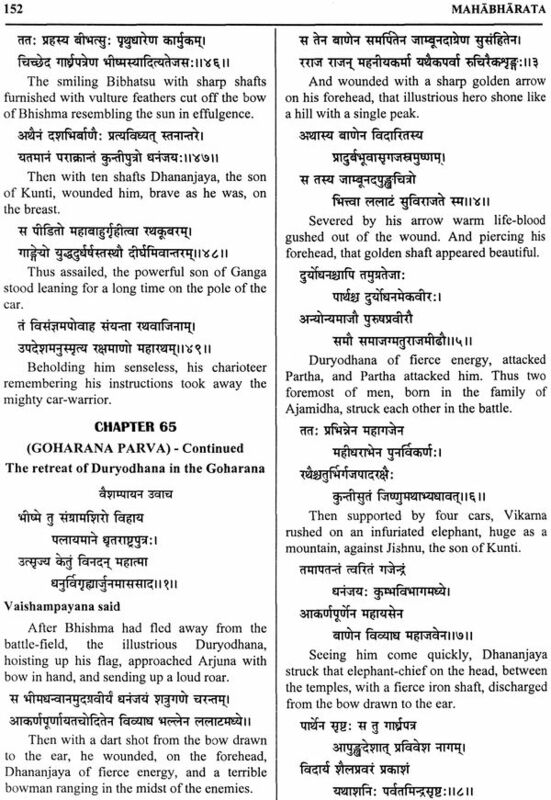 Karna Parva - Bhima kills Dussashan, thus avenging the honour of Draupadi. 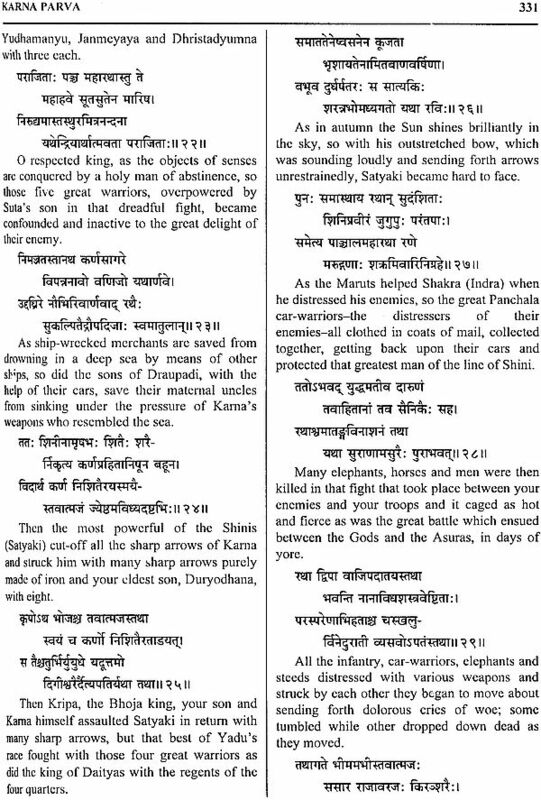 A terrible duel takes place between Kama and Arjuna. 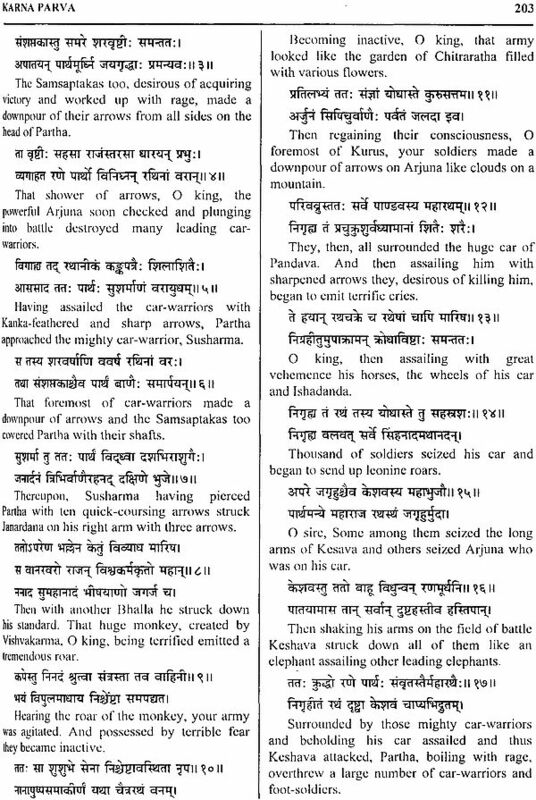 The wheel of Kama's chariot sinks into mud and Arjuna kills him. 9. 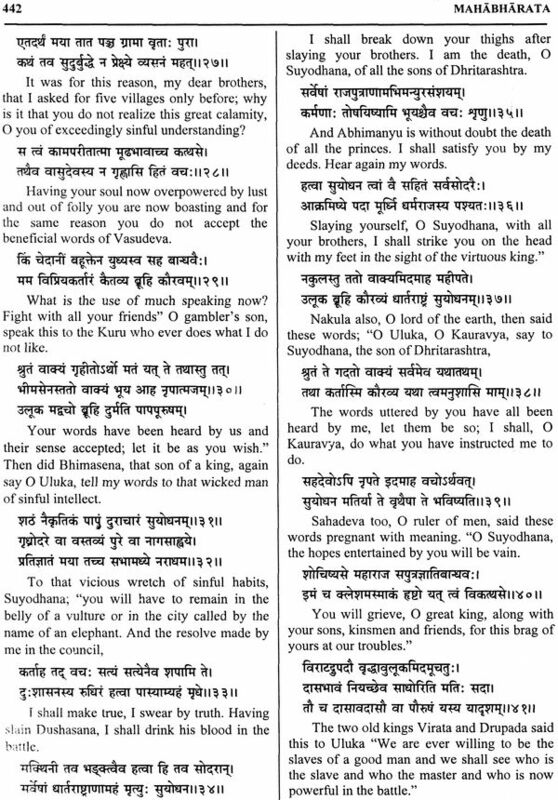 Shalya Parva - This deals with the war and execution of Shalya who is killed by Yudhishthira. 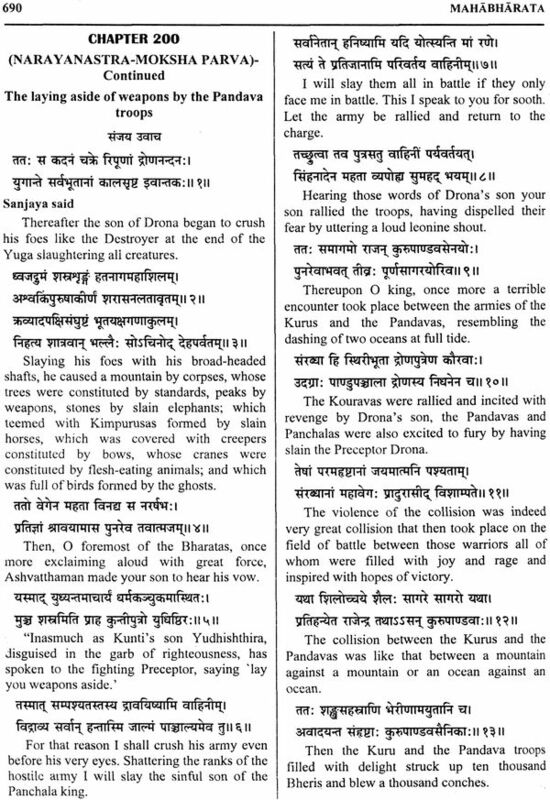 Sahadeva kills the old and mischievous Shakuni. 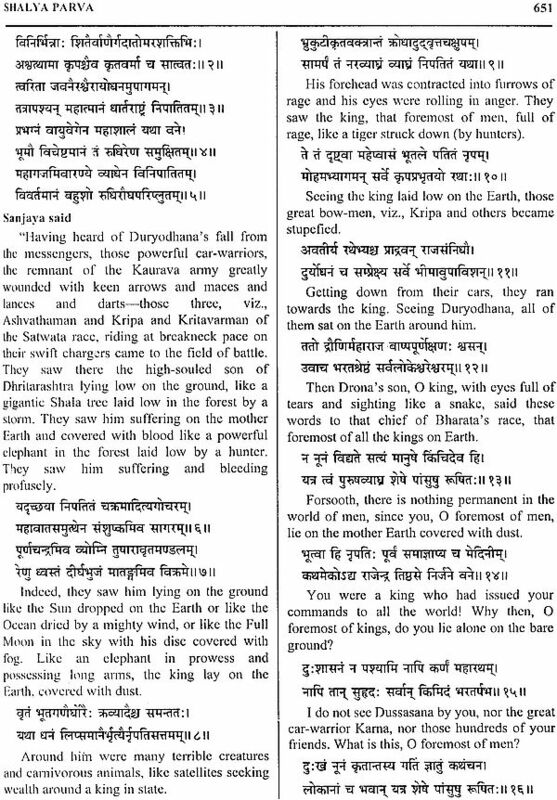 Duryodhana is alone. He takes refuge in a lake where, through magical power, he hides himself under water. 10. 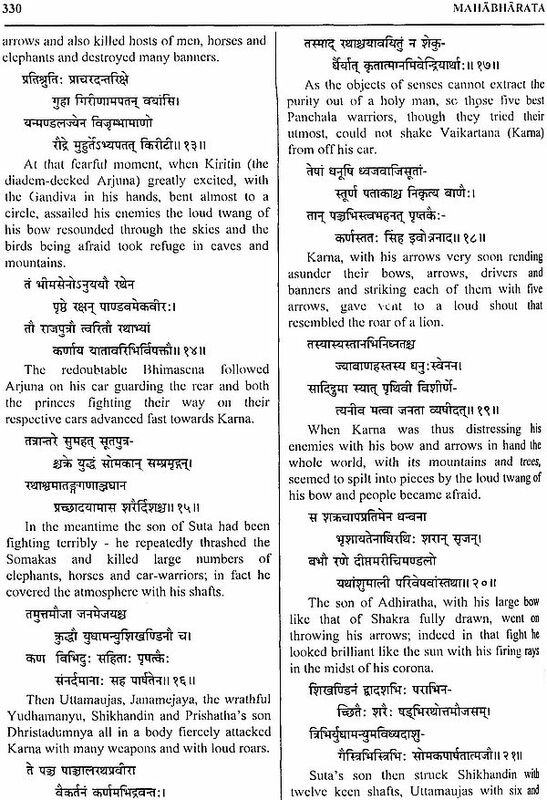 Svastika Parva - It has the main story of slaughtering the five sons of the Pandavas. 11. 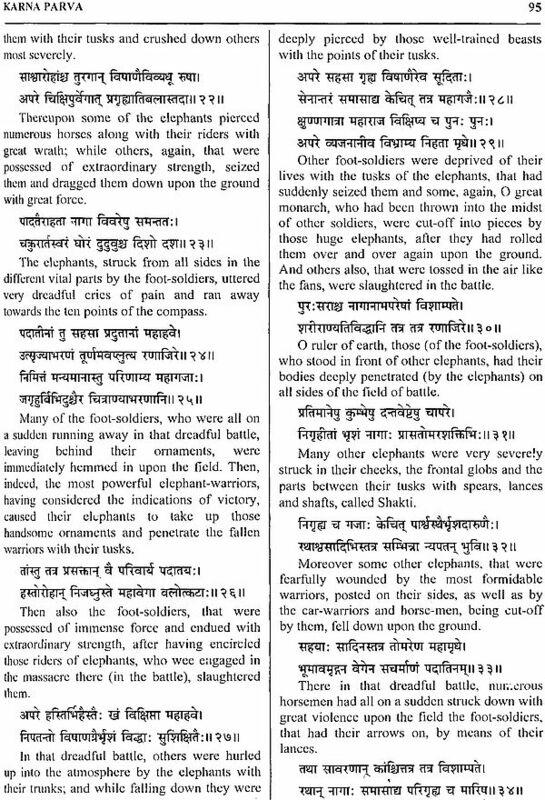 Stri Parva - The ladies of the Kauravas visit the battle field and Gandhari describes her horrible vision. Her daughters-in-law, dishevelled and frantic, cry and lament near the corpses of their husbands. 12. 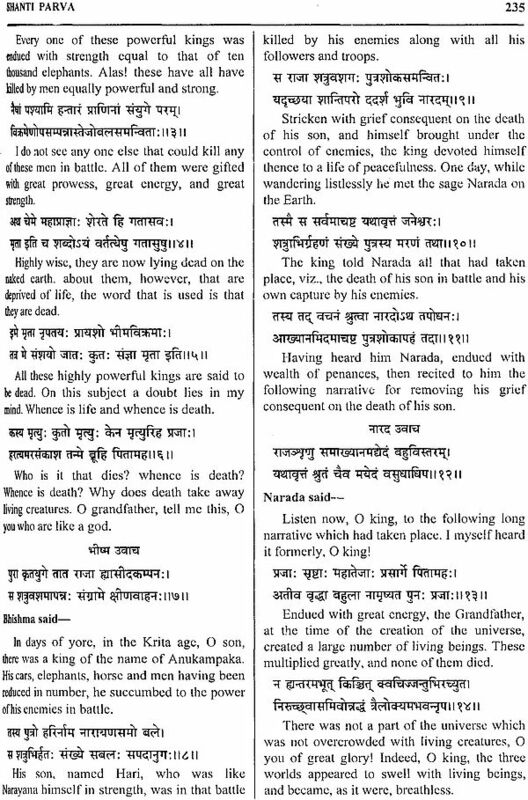 Shanti Parva - The true story of Kama's birth having been revealed, Yudhishthira decides to expiate his fratricide by retiring to the forest. He is dissuaded from doing so and is installed on the throne. 13. 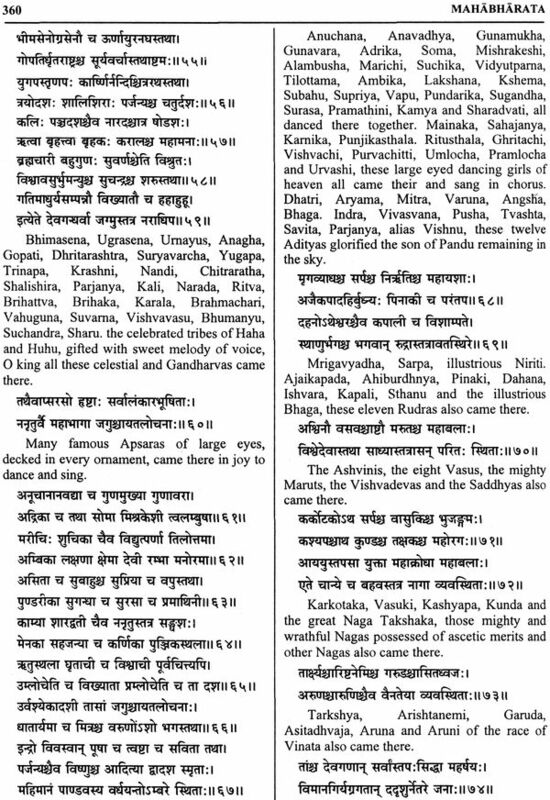 Anushasana Parva - It has main events related to Bhishma's expiry. In the presence of a great concourse of people, Bhishma's spirit ascends to the skies. 14. 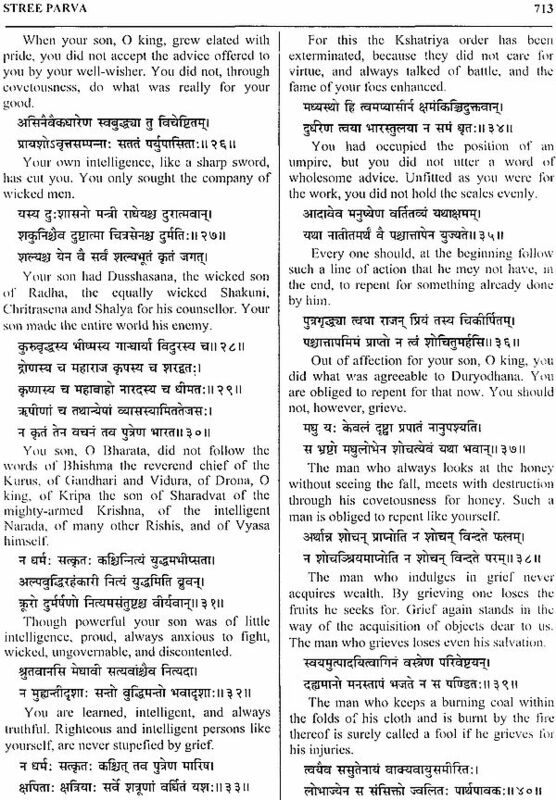 Ashvamedhika Parva - Yudhishthira is advised to perform the Ashvamedha Yajna. 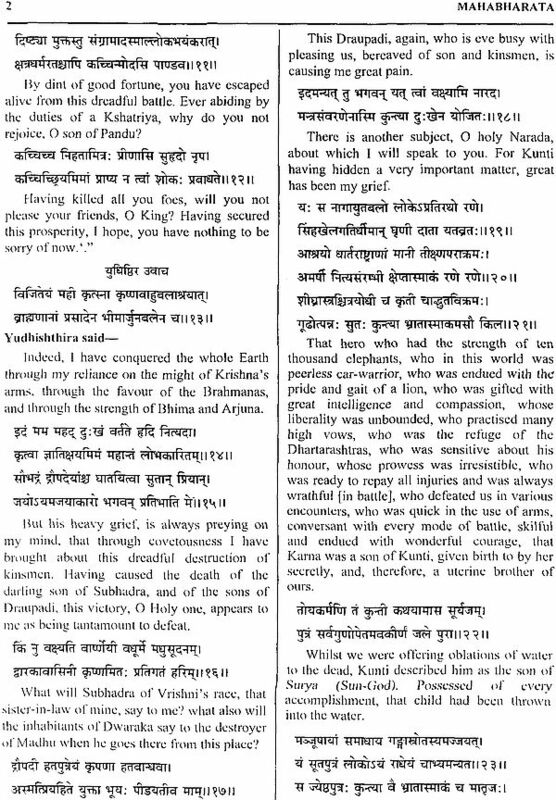 Uttara, the wife of Abhimanyu, gives birth to Parikshita. 15. 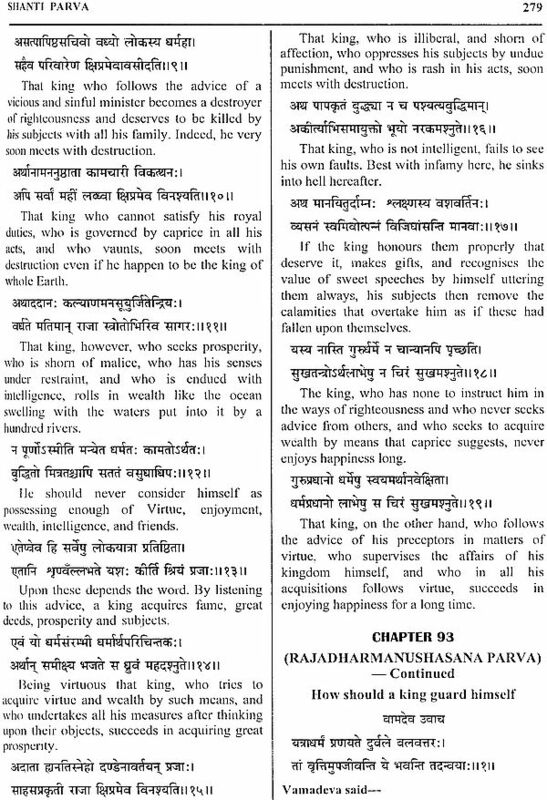 Ashramavasika Parva - This gives the description of Vanaprasthashrama of Dhritarashtra. For fifteen years, Dhritarashtra and Gandhari live with their nephews. Then they retire to the forest. 16. 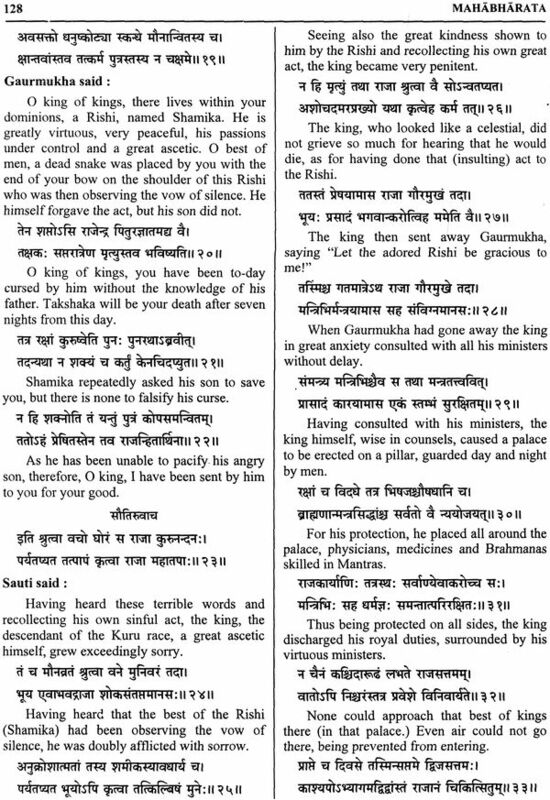 Mausala Parva - In Stri Parva, Gandhari blames Krishna for not having prevented the slaughter of her sons and curses Krishna. 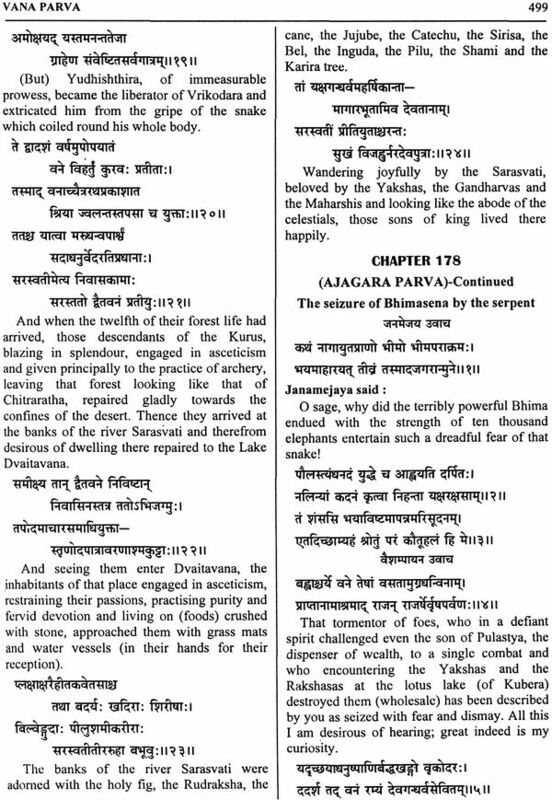 As a result thereof, the fight with the help of Musala, takes place between the Yadavas. In a club fight Balarama is killed. 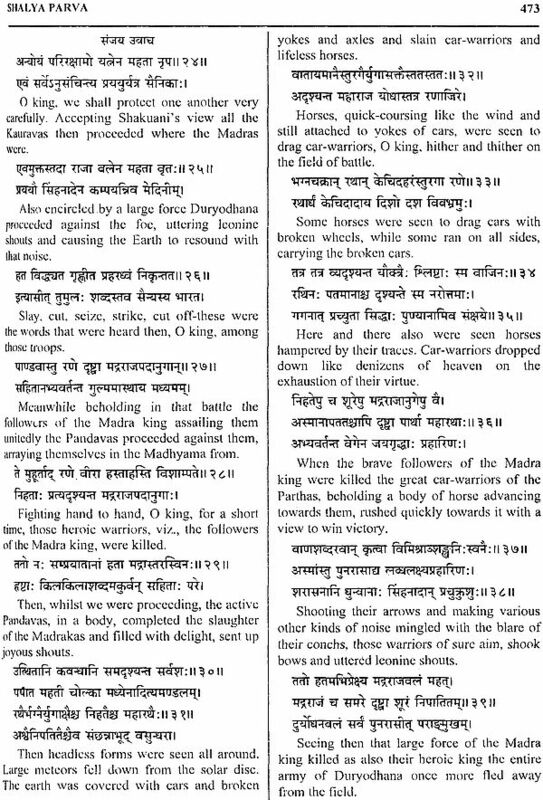 Also Krishna is killed by a hunter. 17. 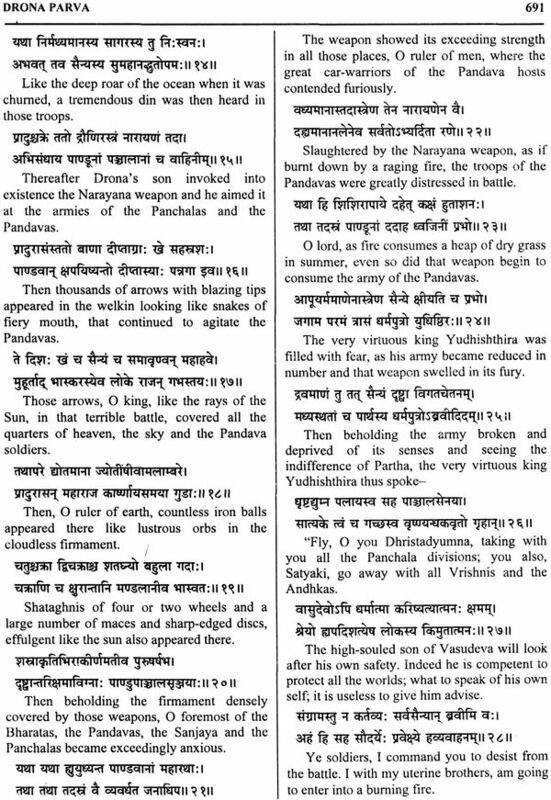 Mahaprasthanika Parva - It describes the Pandava's going to heaven. 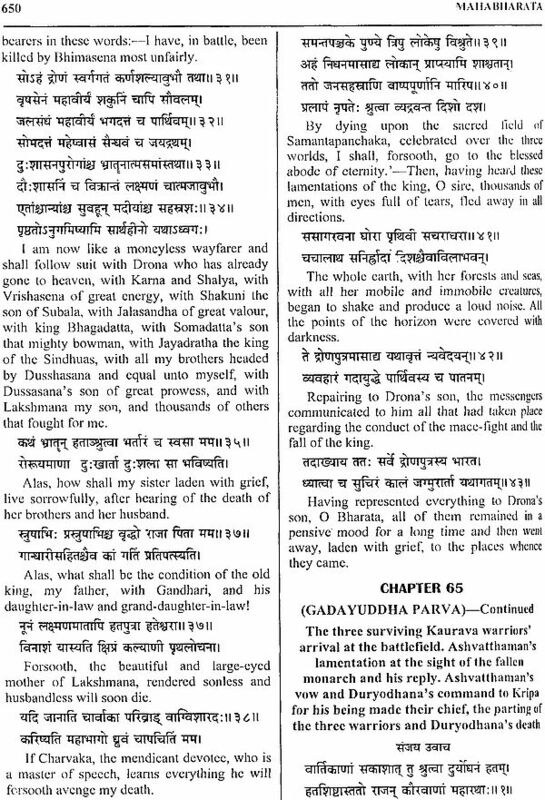 The five brothers accompanied by Draupadi retire to mount Meru. 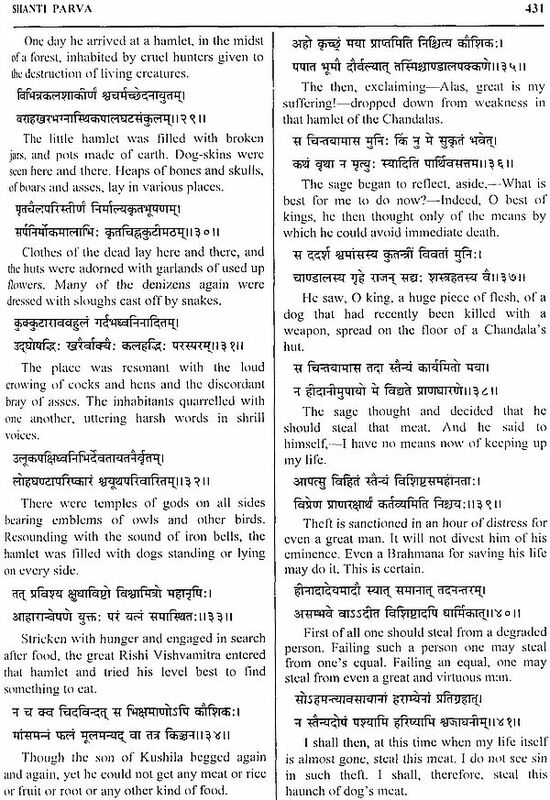 They all die except Yudhishthira. 18. 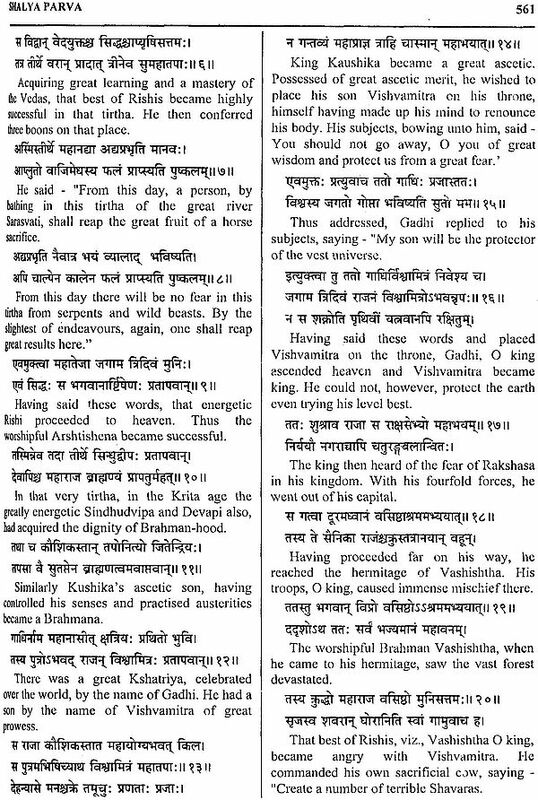 Svargarohana Parva - Yudhishthira refuses to enter heaven if his brothers and his dog are not there with him. 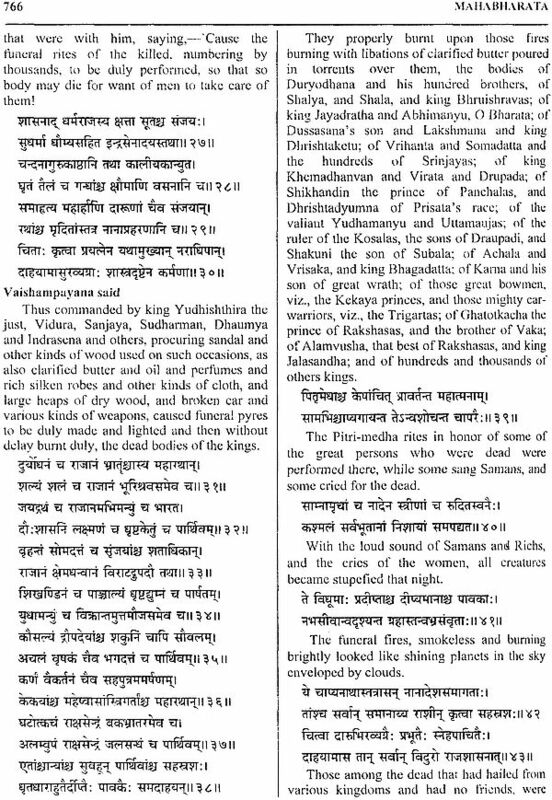 Yuclhishthira, on reaching heaven, sees Duryodhana seated on a throne, but does not see his brothers and Draupadi. But actually this was an illusion. 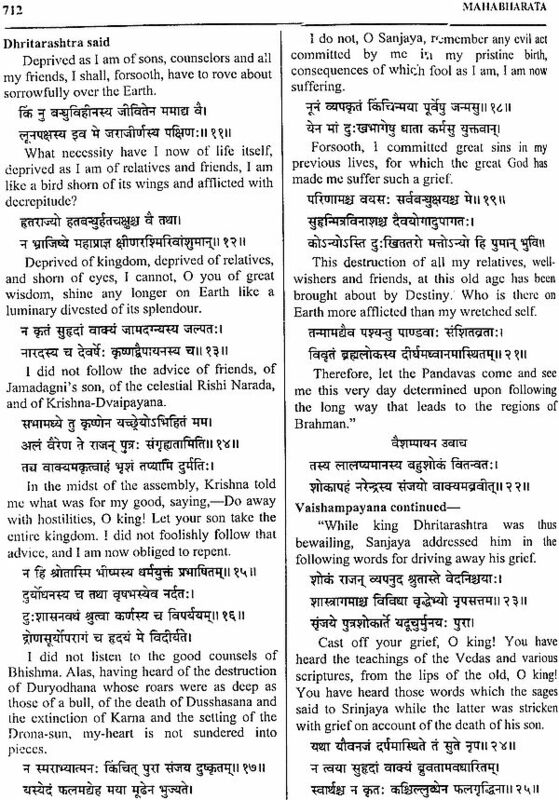 He meets his brothers and Draupadi.